It’s incredibly easy to produce a podcast, whether for yourself or your B2B business. But without a podcast promotion plan, no one is going to be listening. And when you look to Google for the answer you’re going to get 5 million results for how to promote your podcast episodes that fall somewhere between 101 tactics or a podcast equipment checklist. Who has time to tackle a 101 tactics promotion plan? We recently interviewed Jeremy Solly, a strategic marketing consultant, who consults brands and agencies on launching their B2B podcasts, including Cambia and The Dendro Group. We got his advice on what he called his Podcast Episode Promotion Plan. You can read that portion of our conversation below, or listen to the episode to get the full measure of building a B2B podcast. 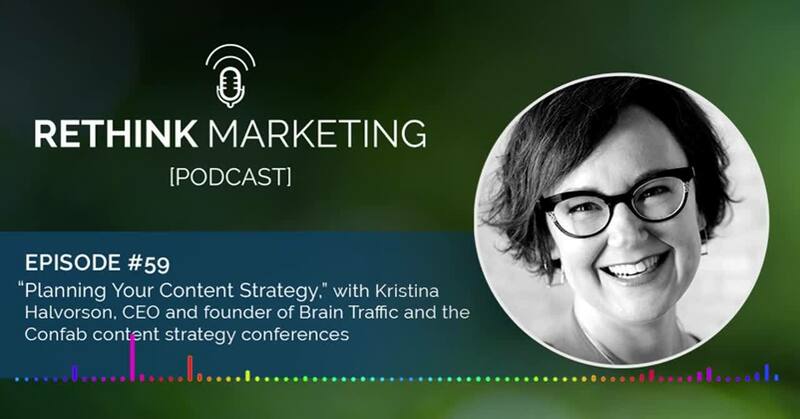 At Act-On, we’re approaching our 100th episode of the Rethink Marketing Podcast. I have learned many lessons in the two years we’ve been producing the show. But the biggest is one I still struggle with, and that’s consistently promoting each episode. As Jeremy says in our interview, the easy part is recording and producing the podcast. The hard part is in promotion. And that’s true for all the content your business creates, whether that’s a blog post, webinar, eBook or customer event. So, here is my stab at creating a promotion plan that seems doable and also checks all the important boxes. I’m sure there are other things we can do. Let me know in the comments. We’ve had Larry Kim, Ann Handley, Rand Fishkin, Jay Baer, Tyler Lessard, Matt Heinz and countless other marketing thought leaders on the show. We’ve covered big picture topics, and also dived deep into marketing automation tactics with Phil Bosley. Start with content. Why should they be listening? If you are delivering value-added podcast episodes for your targeted audience, then you are also creating SEO-worthy content that can be found by Google and the other search engines when those listeners are seeking answers to their questions. So, make sure you optimize each episode landing page. Treat it like it was a blog post that you were optimizing. You can learn more about how to write SEO-friendly content in this post. If you’re doing this on a WordPress site, you can use the Yoast plugin to help guide you through the process. It covers such things as H1 title, meta description, internal and external linking, focus keywords, optimized images and so forth. This also may be an opportunity to transcribe the interview and either post it in full, or as a more in-depth episode show notes. You should also consider including ways for listeners that visit your landing page to 1. Subscribe to the podcast (typically via Apple podcast); and 2. Subscribe to your email list (whether that is a bigger blog newsletter email, or just one for podcast listeners). You need to say thank you once you have landed those great guests – and every guest is a great guest – and recorded their episodes. This can be done in a simple email, or via a thank you card, or both. Below is an example of the email I send guest letting them know that the podcast has been published. We also mail out branded thank you cards (though I could do a whole lot better at getting them mailed). And you’ve seen the movie scene where sports agent Jerry Maguire is pleading to Rod Tidwell, his last client, in a stadium locker room. “Help me, help you,” Jerry says. Well, you need to help your guests help you promote your episode. In that email, you can provide 2-3 tweets they could share. You could send them the episode thumbnail image that they can use on social. Aaron Orendorff (@AaronOrendorff) embeds a Click to Tweet link in his thank you message so the person only has to click to share socially. Getting a guest with 750,000+ Twitter followers is awesome, especially if they show you some love by promoting their episode. But there are no silver bullets to promoting your podcast, so onward to step #4. Lauren Teague mentioned this in our podcast episode on social media strategy, but Twitter, Facebook and the other social platforms are not in business of free anymore. It is harder and harder for your social posts to be seen organically by your followers. We’ll talk about paid promotions later, but right now, you need to plan on sharing multiple times on social, and in creative ways to get the attention. One way is to create 2-3 image quotes that highlight a point or quote from you or your guest in each episode. Buffer has created a basic template that you can copy here. You can use video, too, to promote your podcast episodes. 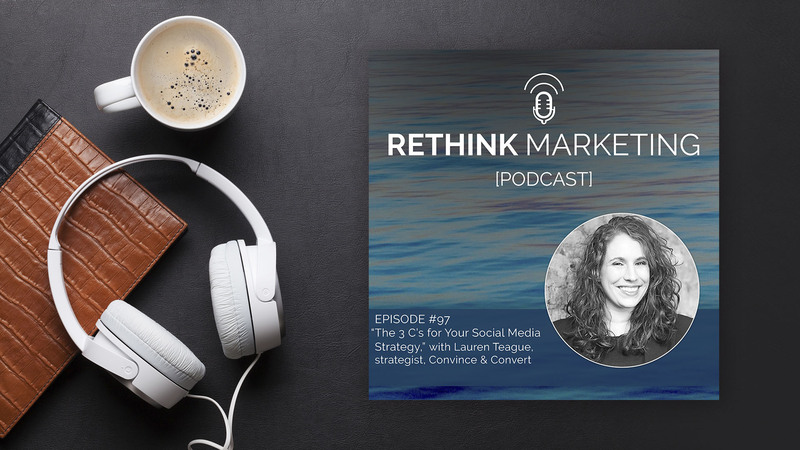 I do this for the Rethink Marketing podcast and then share those videos on LinkedIn. The results have been great. Another creative way to promote your episode is by creating a video of the audio wave spectrum as someone is talking. There are paid services that will do this for you, or if you have the Adobe Creative Suite, you can create your own template to do this, as I have done below. Also, make sure you appropriately tag your guests, as well as any other people or brands that were mentioned in the episode. That is an opportunity to create new partnerships, as well as reach new audiences. And share multiple times. If the content is valuable enough, and evergreen enough, you can continue sharing it even a year later to reach new listeners. Perhaps the best way to build your podcast listenership is through building your email list. This is the core tactic employed by Tim Ferriss, Farnoosh Torabi, Noah Kagan and others. Jay Baer’s Social Pros podcast is building its list via Facebook Messenger. Whether via email or messenger, these brands typically offer some exclusive content or access to subscribers. This includes transcripts of the show, previews and outtakes of podcast shows and more. As you build your list and engage with subscribers, you want to include recaps of past shows, links to current releases, as well as CTA’s to subscribe to the podcast via iTunes, and while there, leave a review and rating (which further help your podcast’s discoverability). Depending on your budget, you may want to include some paid promotions on social, whether that’s Facebook, LinkedIn, YouTube, or Twitter. Most platforms allow you to hyper-target your ads to your target audiences. From there, you can also consider adding in retargeting. Too often brands overlook the promotion opportunities they already have. Add information and links to your podcast in the company descriptions and image headers on your social channels. You can add your podcast’s iTunes link in your email signature; or in your webinar and presentation decks. You should also promote your podcast and recent episodes in your prospect and customer newsletters, as well as in your automated lead nurture programs. You can also publish transcripts or recaps on each episode in your blog. You can also integrate it into SlideShares, eBooks, webinars, and more. For some marketing influencers, we’ve grabbed their 10 best quotes from the podcast interviews and turned them into SlideShare presentations. There are some tablestakes activities you need to tackle when launching your podcast. This includes connecting the RSS feed from your podcast hosting platform to iTunes, Google Play, as well as the other podcast aggregators (Overcast, Stitcher, etc.). Nathan Isaacs: You were talking about how you can use podcasts throughout your marketing strategy. You can use it in email and so forth. Do you think about that ahead of time? Where am I going to distribute this podcast? Jeremy Solly: This gets into promotion. What we did from a strategy standpoint was we had a laundry list of here’s all the potential ways we could use this. If we record this, here’s all the potential ways. It’s going to go out on Stitcher. It’s going to go out on Apple podcasts. So, subscribers can get it there. And we’re going to put it on the website. And we’re going to transcribe this into a blog. And we’re going to put it in our email newsletter. You just have that laundry list. And then the thing that we did was we created this thing called a PEPP. It’s a podcast episode promotion plan. And then we had PEPP rallies to fill out our PEPP. And then each episode’s promotion changes a little bit. One of the most important things you can do is when you do an episode, and especially if you’re an interview format and you’re leveraging influencers, or you’ve interviewed someone super interesting or famous, or whatever, you want to have them promote it through their channels too, right? It starts to make this waterfall effect. Nathan: It seems the marketing side of the podcast is the critical part and probably the most work, right? You and I, we’re going to talk for a half hour here. I’ll spend another hour and a half, two hours editing and all that. Then that work is done. It’s staged. But it seems like for this to be effective, I’ve got to let people know about it, right? Jeremy: Maybe I’m over-generalizing here, but I think the easiest part is the actual recording. The sitting in a room with a microphone is the easiest part. Because you’ve scheduled 30 minutes, we’re going to talk for 30 minutes, and we’re going to be done. The two hardest parts, I think, are: One, is the strategy at the very beginning, spending months of developing our game plan, this is our true north, all the stakeholders are bought into it, we’re going to try our best not to deviate until maybe a certain point in time. At the end of the year we’re going to evaluate. That didn’t work. This did work. We’re going to shift our true north a little bit. If you do that, it should make your planning of the content flow pretty naturally. That shouldn’t be as hard. And then, you’re right, the promotion after is a ton of work. Are you going to put money behind it? Are you going to advertise your podcasts and drive more people to listen to it. I do think the bookends are the hardest part. The strategy before you even start recording your first episode and the promotion of each episode afterwards takes a fair amount of work to just get it out the door and get it in front of everybody. Nathan: You just have that consistency about it all, right? And I tell you, that’s my challenge. It’s like my diet. One week I’m really good, and the other week I’m going out and getting Burgerville milkshakes. Jeremy: Oh totally. There’s definitely some weeks where you’re like, all right, I did the bare minimum on the PEPP, and I got it out the door, it’s done, and we’re already on to the next episode.